Outgoing WACD President, Shaun Sims administers the oath of office to newly elected President Todd Heward and Vice President Dan Rice. CHEYENNE, Wyo. — The state's 34 local conservation districts elected new association leadership during their recent convention held in Evanston at the Historic Roundhouse. 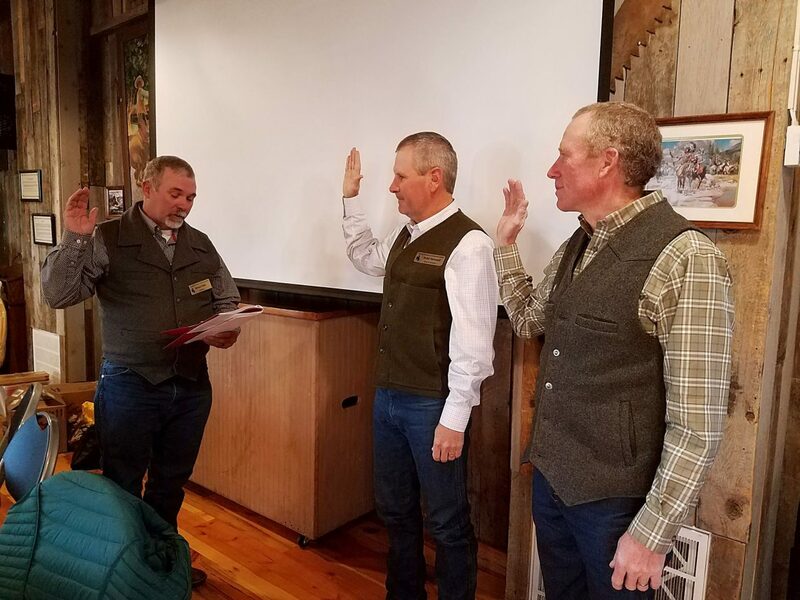 Todd Heward, of Shirley Basin and Medicine Bow Conservation District stepped up from the vice president to take the helm as the association's president succeeding Shaun Sims of Evanston who served in the role for the past eight years. Dan Rice of Ten Sleep and the Washakie County Conservation District will assume the position of vice president. "It's an honor and a privilege to lead such a great organization. I look forward to working with great staff, board supervisors and employees across the state. I believe Wyoming's natural resources are the foundation of all that takes place in our great state. I'm excited to continue the association's great efforts in conserving those natural resources. Heward has served on the Medicine Bow Conservation District since 2013. He is a fifth generation cattle and sheep rancher on the family ranch homesteaded in 1909. Heward earned a bachelor's in watershed management and rangeland ecology from the University of Wyoming. The Heward family is a past recipient of the Wyoming Stock Growers Environmental Stewardship Award. Heward has served on a number of committees and workgroups related to Greater Sage Grouse conservation and wind energy development. Rice is a fourth generation rancher from Ten Sleep. He has served on the Washakie County Conservation District board since 2008. Rice has also served on his local school board, an advisory board for Security State Bank and the local Farm Service Agency county committee. Rice represented Wyoming's districts as a national director in 2017. 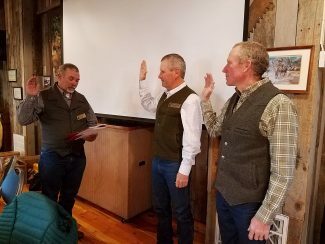 Also joining the board is banker and rancher, Ryan Fieldgrove of Buffalo; Shanon Sims a rancher from Rock River; Levi Clark a banker and rancher from Wheatland; and Reg Phillips, a rancher and property manager from Dubois. Fieldgrove replaces Bob Maul of Gillette who was elected in November as a Campbell County Commissioner, Sims will serve on the board as a director during Heward's term as president, Clark replaced Curtis Grandstaff of LaGrange and Phillips replaced Jeri Trebelcock of Lander.